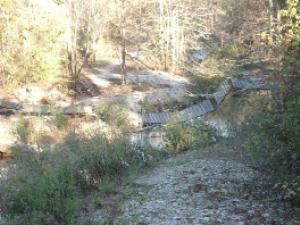 I went to hike this trail and found that the suspension bridge was washed out. The trail beyond was closed off and over grown. I never escaped the sound of autos crossing over the dam. I saw a number of people on the trail and due to its exceptional short length we kept running into each other. The only part of the park open for hiking is the wheel chair area. The park's bridges need to be repaired in order to be worth the drive.